In response to accidents, unregulated causal factors and the National Transportation Safety Board’s recommendation (NTSB R-06-19), the Federal Railroad Administration (FRA) Office of Safety together with the Office of Research and Development initiated a study to identify and evaluate the safety of concrete crossties. The FRA established a task force to develop recommendations and provide guidance to the Railroad Safety Advisory Committee (RSAC) Working Group on concrete crossties. A rail profile measurement system capable of accurately measuring rail cant was installed onboard FRA’sAutomated Track Inspection Program (ATIP) track geometry cars (see Figure 1) in order to collect valuable data regarding concrete crosstie rail seat deterioration. The intent of this collaborative effort is to provide practical guidance for manual and automated inspections of concrete crossties, and to reduce the number of track geometry-caused derailments that occur when the rail seat pad material deteriorates and exposes the rail base to the concrete (see Figure 2). The deterioration, or abrasion, is the result of a compressive load and/or the mechanical effects of deterioration from repeated, concentrated wheel loading, which typically develops a triangular void on the field side of the tie and allows the rail to tilt or roll outward under load, increasing track gauge (see Figure 3). Between April 2006 and March 2007 a task force made up of government and railroad personnel studied the problem and addressed the need for a concrete crosstie safety advisory and the potential need for new regulations in theFederal Track Safety Standards. The recommended guidance would primarily promote widespread adoption of a concrete crosstie performance specification in FRA Class 2, 3, 4, and 5 track. The guidance would address (at a minimum) missing, broken, or wear limits for rail seat “abrasion” and tie pad failure; and rail fastener integrity (fatigue failure), including the loss of appropriate toe load pressure, improper fastener configurations, and excessive lateral rail base movement. The concrete crosstie performance specifications would take into account the data and analytical information associated with the high-profile Amtrak derailments at Stevenson and Sprague, Wash. This includes information relating to track and operating conditions; truck rotation and car and locomotive and car suspension characteristics; the design specifications and research history of concrete crossties; track maintenance practices; and preventive automated and manual track inspection procedures. Recommendations would also take into account the mechanism (mechanical and compression) of or basis for rail seat failure. They would utilize computer simulation data to compare the truck side L/V, gauge-widening and rail rollover forces associated with the P42-type Amtrak locomotives (versus the freight locomotives operating in the accident area) and why the lightweight passenger locomotives derailed when the more frequent and heavier freight locomotives didn’t. The effort would also examine the combination of FRA-compliant but irregular track geometry conditions such as gauge, profile, crosslevel and alignment that contribute to excessive lateral wheel / rail forces, which may impose greater wheel force than a singular noncompliant geometry condition. The study was designed to lead to a method of detecting rail seat failure through automated inspections such as the FRA’s ATIP geometry cars and R&D geometry and Gauge Restraint Measurement System (GRMS) test cars, railway-operated geometry cars, and hi-rail-based geometry / GRMS cars. Data from these vehicles would be used to develop performance-based rail cant and base gauge requirements that are specific to concrete crosstie or comparable construction specifications and tolerances focused on establishing, identifying and locating excessive individual or combined values relating to inward / outward rail cant and base gauge measurements. Measurements would be used to establish a basis for automated performance-based thresholds relating to, or caused by, missing, worn, and damaged fasteners (sprung clips); worn or missing tie pads; failed crossties (due to mechanical wear or compression on the surface or underneath); center broken or visible reinforcing strands (in the gauge, crossties rail seat area, and shoulder areas); and worn, or damaged concrete rail seat deterioration. This effort would enable the industry to develop automated procedures and on-the-ground confirmation of rail cant and base gauge measurement values. It would also help the industry to develop and implement the tools and procedures to manually inspect, measure and identify concrete crosstie rail seat deterioration under load. These tools include a toe load (torque or resistance force) gauge and a void (feeler) depth gauge. (Note: 1/8 inch void in the rail seat area equates to one degree of inward or outward rail cant and correspondingly affects track gauge about 1/8 inch.) This effort would also examine the crosstie support required to support typical loadings and to maintain track geometry safety limits, according to track classification. The use of concrete ties dates back to 1893. The first U.S. railroad to use concrete ties was the Reading Company in Germantown, Pa. (1). In 1961, the Association of American Railroads (AAR) performed comprehensive laboratory and field tests on the performance of pre-stressed concrete ties (2, 3). Replacing timber ties with concrete ties on a one-to-one basis at 19 – 1/2-inch spacing proved acceptable, based on engineering performance, but was deemed uneconomical. Increasing tie spacing from the conventional 19 – 1/2-inch spacing to 24- or 30-inch spacing made the use of concrete ties more economically feasible. While the greater tie spacing increased rail bending stresses and the load that each tie transmits to the ballast, the rail bending stresses were determined to be within design limits. And by increasing the tie base to 12 inches, the pressure transmitted from the tie to the ballast on concrete ties was no greater than the force transmitted by timber ties. Research showed that increased tie spacing (while maintaining rail, tie, and ballast stresses at acceptable levels), made concrete an economical alternative to timber ties. Research efforts in the ‘60s and ‘70s were focused on the strength characteristics of concrete ties (i.e., bending at the top center and at the bottom of the tie and under the rail seat, material optimization such as aggregate and pre-stressing tendons and concrete failure at the rail-tie and ballast-tie interface.) Abrasion or failure of the concrete surface between the rail and ties became apparent when large sections of track were converted to concrete ties, especially on high-curvature and high-tonnage territories. In the 1970s, the Portland Cement Association Laboratories undertook a major research effort to optimize tie design. The research included the use of various shapes, sizes, and materials to develop an economically desirable concrete tie. During that time, researchers also addressed several of the initial concrete design problems, including quality control problems and “rail seat abrasion.” Test installations to evaluate the performance of concrete ties were established by several North American railroads and the Facility for Accelerated Service Testing (FAST) in Pueblo, Colo. (4). Rail seat abrasion was also noted in one form or another on four major North American railroads: Canadian Pacific (CP), Canadian National (CN), Burlington Northern Santa Fe (BNSF) and Union Pacific (UP) (5). CN’s concrete tie program started in 1976; researchers noted rail seat abrasion of less than 0.2 inches by 1991. In a few cases, abrasion of up to 1 inch was noted. Abrasion was not uniform across the rail seat. BNSF, which started its program in 1986, saw the same pattern of abrasion as noted on CN. Most of the abrasion occurred on curves. At UP, rail seat abrasion was present on 5-degree curves. CP adopted the use of a bonded rail / tie pad to reduce rail seat abrasion, and found that abrasion occurred shortly after the bonded pad failed. 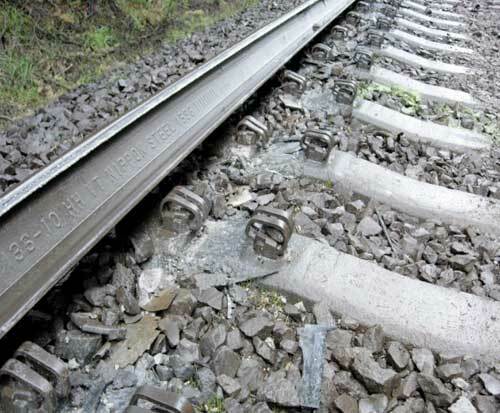 Concrete ties installed in less severe environments showed no evidence of rail seat abrasion. Mechanisms that lead to abrasion include the development of slurry between the rail pad and the concrete tie. Materials found in the slurry include dust particles, fine material from the breakdown of the ballast particles, grinding debris from rail grinders, and sand from locomotive sanding or blown by the wind. This slurry, driven by rail movement, has been shown to abrade the concrete surface, exposing the concrete aggregate and generating concentrated forces on the rail pads. This abrasion process is accelerated once the pad is substantially degraded and the rail base makes direct contact with the concrete crosstie. A requirement for the development of this failure mechanism is the presence of moisture between the rail pad and the concrete tie surface. In areas with low moisture, concrete abrasion is generally not a problem. Moisture coupled with a high number of freeze-thaw cycles tends to accelerate abrasion. It appears that moisture enters the concrete voids and breaks up the concrete upon expansion under freezing conditions. Once rail seat abrasion occurs, the only feasible method of repair is to fill the abraded area with epoxy or another rapidly hardening material that will enable the track to be reopened within a reasonable time period. Railways and suppliers have since developed products and procedures to minimize rail seat abrasion. Elastomeric tie pad materials of various stiffnesses, with steel plates inserted between them, have also been developed to combat rail seat abrasion. Ongoing research efforts are focused on increasing the durability of tie pad materials and their ability to prevent moisture from penetrating the tie / pad interface, and getting under the rail seat. Special thanks to John Choros of the Volpe Center who contributed extensively to the portion of this article relating to the history of and research on concrete ties. (1) Weber, J., “Concrete Crossties in the United States,” International Journal of Pre-stressed Concrete, Vol. 14 No.1, February 1969. 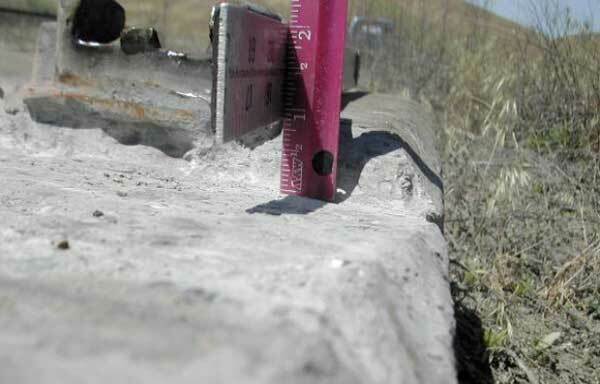 (2) “Pre-stressed concrete tie investigation,” AAR, Engineering research division, Report No. ER-20, November 1961. (3) Magee, G. and Ruble, E., “Service Test on Prestressed Concrete Ties,” Railway Track and Structures, September 1960. (4) Lin, T., Design of Pre-stressed Concrete Structures, Third Edition, John Wiley & Sons. (5) Reinschmidt, A., “Rail-seat abrasion: Causes and the search for the cure,”Railway Track and Structures, July 1991.